Antoine is the co-founder of the coworking space in Fernelmont, a small village north of the city of Namur. He is father to two young daughters and therefore no stranger to youth related events. When a local entrepreneur asked him if he would be interested in hosting a Dojo in Fernelmont, he and his team got to work. Through the coworking network and the local community, he quickly gathered a team of 6 coaches (most of whom are female!). 17 Kids attended the first session in Fernelmont (while only 15 were initially registered). What an instant success! Klaas’ son was invited by a friend to attend Coderdojo Borsbeek. So Klaas started attending CoderDojo with his son and daughter. An instant success, they were all very excited about the initiative. At the same time, Klaas was getting involved in ‘De Theatergarage’, a neighborhood centre in Borgerhout. This was the perfect spot for a new CoderDojo, filling a gap in the geographical distribution of Coderdojo. Because of the efforts of Arielle (she contacted the IT-department and started recruiting coaches), the team was growing fast. Arielle even followed the CoderDojo bootcamp to learn as much about CoderDojo as there is to learn. 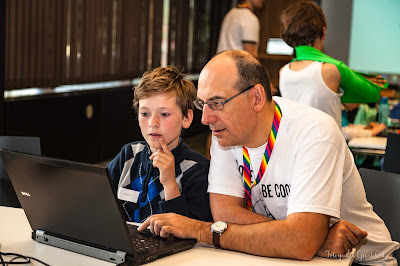 CoderDojo Forest now counts around 10 coaches and hosts sessions for over 25 kids. They are even welcoming some underprivileged kids. Congratulations Team CoderDojo Forest! The ZOVLA library cooperation connects 7 libraries in the south-east of Flanders. CoderDojo is promoted heavily through this cooperation and they already started a CoderDojo in 5 out of 7 libraries. So when the library of Zwalm moved to a bigger building, they quickly began preparations to start a Coderdojo of their own. They managed to gather a magnificent team and started sessions shortly after. Kids at CoderDojo Zwalm enjoy the freedom of coaching together with their enthused coaches, a snack on the side, an extensive selection of laptops and some well-prepared exercises to get them started. The CoderDojo in Zwalm is already a success.